At Flatnose we offer static brochureware and a range of dynamic content management systems allowing hassle free user administration. Please contact us with your enquiry. A dynamic site customised to your personal requirements may be cheaper than you think. Click on the links below to visit the sites. An example of dynamic high quality brochureware with administrative functions allowing announcements and PDF upload for a labels factory in Manchester. 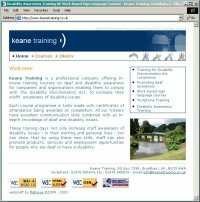 A three page brochure for a company based in Lincolnshire specialising in disability awareness training and sign lanquage courses. 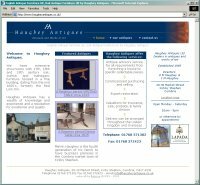 This is a dynamic site commissioned by a high quality antiques shop. It has a user updateable product gallery with featured antiques on the front page. Commissioned by a marketing company based in Lincolnshire, this is an example of quality brochurewear. The site is quick to download, easy on the eye and informative. A simple online ordering service for car web address stickers is one of the features of this site. A red hot custom drum company commissioned this dynamic site. 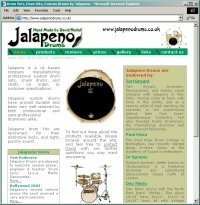 It has a user updateable announcements utility and a gallery of Jalapeno drum kits. An single page site for an engineering firm based in Grantham. Lincolnshire. Another concise site for a bookseller based in Kent, England. This site has an Art Deco feel about it. Commissioned by electrical contactors, this site is a good example of a single page online business card. A local software house who asked for an attractive, fast downloading site with minimal graphics and downloadable products on the front page. 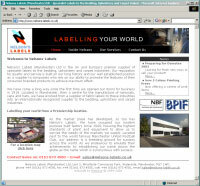 This site features a mailing list and announcements utility. 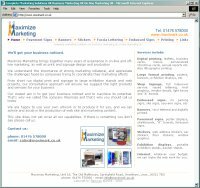 We created this site for an established software company in Grantham, Lincolnshire. A simple five page online brochure for a language school teaching English in France.